In light of the proposed light rail system in Nashville, here are some comparative stats between Nashville and some other light rail cities. I picked these sources because they provide a basis for consistent numbers across cities. By all means do look to update these to more recent figure. Here are the number of jobs within three miles of the city center in 2011, as reported by City Observatory. Here are the number of Millennials (ages 25-34) in “close in neighborhoods” within three miles of the city center in 2010, as reported by City Observatory. Square feet of downtown office space in 2015, according to Colliers. The number of residents in the core of those cities seems really low for an area of roughly 28 square miles. The City Report from which those population figures were taken says that they are the number of 25 to 34 year olds, not the general population. Unless my math is wrong or I am misunderstanding the meaning of “within three miles of the city center,” then those resident numbers are really low per square mile. Making the simplifying assumption that pi equals 3, than those numbers above are for 27 square miles in what presumably would be the most densely populated parts of the metro. Sorry for the double post. I had written one version of the post and was called away from the computer, came back and thought I had deleted that one before posting, wrote another, and then came back to the computer hours later forgetting that I had already posted something along the same lines when I found the first version of the post up. When the data is as old as some of this is, it’s a stretch to draw the conclusions that are implied. 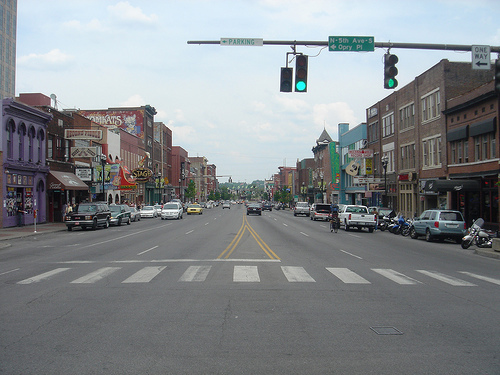 It is important to know that there was no significant downtown new residential development in Nashville until about 2000 (fewer than 2,000 residents in 2000). Since 2000, residential development within the 3 mile radius has increased significantly. The downtown core alone added 4,500 residents between 2010 and 2016. Another 4,000 residents will be added to this core by 2018. The point is that Nashville’s downtown was decades behind peer cities and is catching up quickly. Outside of the downtown core, within the 3 mile radius, are large areas of industrial, commercial and outdated office properties that are in the process of being redeveloped into residential housing. Mr. Troxel, I’m not sure what you saw, if anything, that prompted your comment. The data is from 2015, 2010 and 2011. That isn’t very long ago. And when downtown BNA has less than 1/3 or 1/2 of some of those, “catching up fast” is pure ignorance. You don’t have any data for those other cities and can not judge how quickly they’ve gotten where they have. Nor do you know how many building permits they’ve been issuing the last few years. But that aside, it still doesn’t speak to the reality of rail. Rail is a technology that is good for move GINORMOUS volumes. It has more than GINORMOUS fixed costs. So anything short of that in volume and you’ve poured money down the drain. Even if Nashville had the sort of core density that those other city’s have – it doesn’t – that doesn’t change that none of those city’s investment in rail made sense. For example, Denver’s committed to spending $8 BILLION on just 1 rail line to the airport. Minneapolis has spent a few billion on two rail lines that go slower than the 2 bus lines they replaced and aren’t carrying any more passengers than the existing bus lines were carrying. The tunnel idea is interesting. It may make sense in the long run. But there’s no need for the rail lines. Nashville can build those out with proper BRT – dedicated lanes and all – for 1/3 of the cost and carry just as many passengers as with rail. Then, in 10, 20 – 50 years, if the volumes ever make sense they can always turn around and build the rail. Remember, this is Nasvhille’s one shot. If they max out their sales tax on this they’re done. They have nearly no wiggle room for the next 50 years to do anything more. That’s a certain time type of fragility that’s bound to to go very wrong at some point. Flip – I just revisited this discussion and saw your comments. Thanks for the “pure ignorance” comment – great way to keep a discussion going. I’m a fan of BRT and feel it would accomplish what we want. The challenge in Nashville is that BRT requires vision and understanding of this mode and that understanding doesn’t exist. Bus transit carries a stigma in Nashville and that’s hard to overcome. An attempt was made (albeit poorly executed) to install a BRT along one of our corridors about 4 years ago. Opposition was strong and oddly, many of those objecting to the BRT stated if it was light rail/streetcars, they would be for it. In order to get this transit plan over the finish line light-rail is necessary because it is sexier and more understandable. Light-rail has the buy-in that BRT doesn’t have. I do expect that BRT will play a heavier role in the final designs of the transit plan in the coming years. To get this approved by the voters first, light rail is necessary. I agree that we have one shot here and the first step is to get the plan approved by the voters.